I was told there is meant to be a heatwave next week but I’m not so sure. I think maybe we have said goodbye to the shorts and shades days for a while now. I’m quite excited for winter though in some ways, it reminds me that Christmas is coming! These photos were taken when we had some sun and it was actually one of the hottest days of the summer. I was travelling all day and although this outfit looks casual and cool It definitely was not on stuffy trains and walking miles around a city carrying luggage! I was kindly given this playsuit by my mums friend who gave me TWO sacks of clothes. SO nice! The playsuit is so comfortable (although not when it is the hottest day of the year). I will definitely be saving this playsuit for when it warms up again. 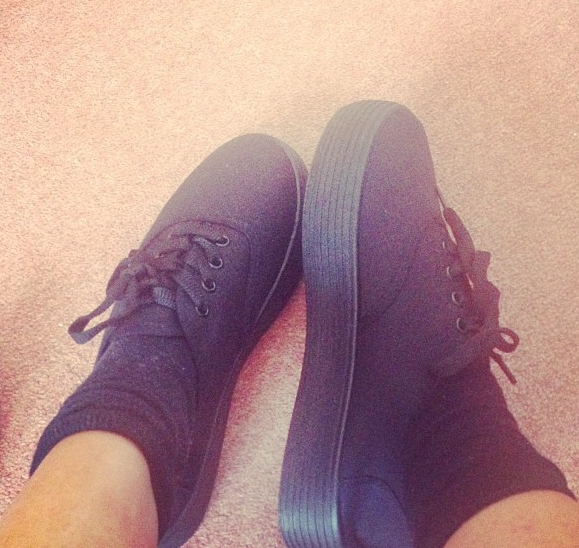 I’ve wanted a pair of platform plimsoles for over a year now, preferably for my two summer holidays in June. I managed to get a pair finally little later than I had planned. They have definitely come in handy though this summer, especially for foam parties! At £10 though, this is pretty ‘expensive’ for Primark right? The best part of this blog? The model. Loving the playsuit, such an amazing print. Most gorgeous hair too. lovely <3Visit my blog ?http://www.derepentenaotemidade.com/Kisses!